Europe's first mission to Mercury will target the early morning of 19 October for launch, Arianespace and ESA announced today. 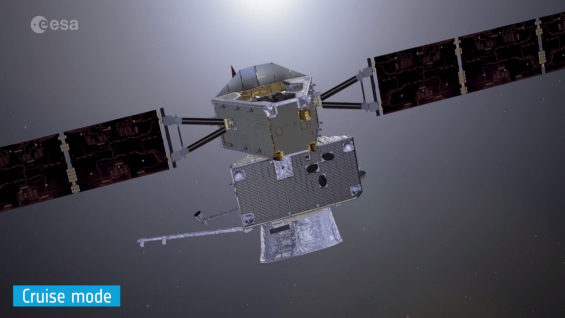 The joint ESA-JAXA BepiColombo mission will launch on an Ariane 5 from Europe's Spaceport in Kourou, setting a trio of spacecraft on course for Mercury. The spacecraft will travel together: a transfer module will carry the two science orbiters – the ESA Mercury Planetary Orbiter and the JAXA Mercury Magnetospheric Orbiter – using a combination of solar power and electric propulsion, and nine gravity-assist flybys of Earth, Venus and Mercury. "We have had a great start to our launch campaign in Kourou, and are on track for launch in less than ninety days," says ESA's BepiColombo project manager Ulrich Reininghaus. "We have an incredibly packed schedule, but it is great to see our spacecraft building up together for the final time." Simulations for key operations have also started at ESA's operations centre in Darmstadt, Germany. Personnel are also practicing non-routine events to be prepared for all eventualities on the journey to Mercury. The composite spacecraft 'stack' will make the first flyby of Mercury just three years after launch. A number of scientific instruments will be active during the planetary flybys, with the transfer module's 'webcams' offering the potential to capture simple images before the main science camera is operational in Mercury orbit. Check our gallery for regular image updates from the Spaceport.